It has been about two years since we bought the Nexus One. Which is great timing for the two-year itch - that starts something like “Now that the phone is not under warranty, do you think we should ...”. To add to the itch was a real problem - Nexus One's fatal flaw so to speak. The phone has a minuscule amount of memory on board - a paltry 512MB which not only included the entire Android installation, but other pre-installed crud disguised as system applications. This meant even after moving some of the applications to the SD card, we were forever playing a game of whack-a-mole trying to free up just enough disk space for the phone. 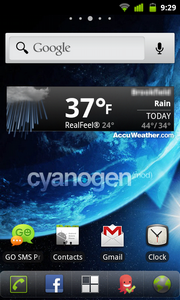 That is when I decided to replace the original firmware with CyanogenMod 7(CM7). And since this was a phone that was not going to be customized heavily - the reasons to modify were fairly light. The process I followed was the official process prescribed in the wiki over at the CM site. Here are some notes to go with the instructions in the wiki, that I am not planning to leech over. Always important to backup. Especially since the process of unlocking the bootloader will reset your device to factory settings. I used GO SMS Pro to backup SMS. Which by the way, is a great replacement for the custom SMS app. 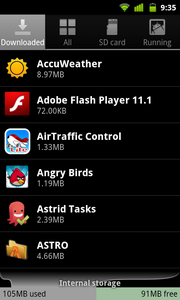 Astro File Manager to backup all applications. Then connect the phone to a computer and copy over the entire SD card as well. A couple of things to keep in mind while unlocking the bootloader - firstly the phone is going to reset to factory settings. Don't ever think that you will be able to keep it like-for-like. Secondly a by-product of the reset is that if you have had to enable the developer mode to access the SD card via USB, you will need to re-enable that. While the wiki mentions this in passing, once you reboot this step is essentially undone. So moving from this step to the next must occur without a reboot. Which brings us to the second question - how does one then “boot into recovery”? The process varies by phone, but in the case of the Nexus One - briefly click the power button after installing the recovery image. This will refresh the options on screen giving you a recovery mode to boot into. If you were following along, here is where you need a lot more preparation than the wiki lets you in on. In reality you are already in step 4 of this section by the time you are done with the previous section. So if you were planning on downloading the zip files at this point - tough luck. Maybe that is something you do when you backup? 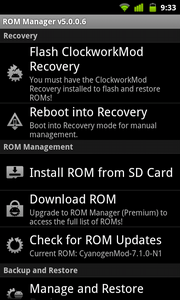 Or at least when you get the recovery images in, make sure you copy the CyanogenMod version you want to install onto the root of the SD card. Otherwise, you might have to re-boot into the factory fresh device to do that. Final bit of a heads-up. When you restore from backups using Astro File Manager, it has a tendency to restore all applications to the phone internal memory. So after the first few, the rest of them are going to fail. So you might have to restore them one-by-one, moving the big apps to SD along the way. That is it, more than a week into the installation, and the phone is still going strong. A detailed view of CM is probably going to follow - but so far really good.